Honolulu is one of the most popular tourist destinations in the world. When visiting the capital of the Aloha State, consider these top family friendly attractions. Waikiki summons images of gnarly waves and pristine sand across the globe. This series of beaches, which once hosted Hawaiian royalty, is now a popular haunt for tourists and locals. Visitors will find a statue honoring the legendary Duke Kahanamoku at Kuhio Beach. Families will enjoy swimming at San Souci Beach. Fort DeRussy Beach has a park and incredible snorkeling opportunities. Diamond Head is an iconic symbol of Hawaii. When you take the leisurely 45-minute trek to the rim of this dormant volcano, a portion of your journey is inside the mountain. The 760-foot summit offers magnificent views of the surrounding area. The lookout point has a bunker that was constructed in 1908 that served as a coastal artillery observation point. 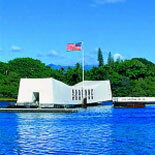 A Pearl Harbor Arizona Memorial and Punchbowl Tour takes visitors back to the events on December 7, 1941. The Arizona Memorial and Punchbowl National Cemetery pay tribute to service members who made the ultimate sacrifice. The tour also includes an overview of the Iolani Palace, the statue of King Kamehameha, the Kawaiahao Church and the Mission Houses Museums. Oahu Grand Circle Island with Dole Plantation takes guests on a 120-mile sightseeing journey around the island of Oahu. You will enjoy the commanding views from Amelia Earhart Lookout and fun activities at the Dole Pineapple Plantation, including the maze and a miniature train ride. The experienced guide provides a narration about the cultural and natural landmarks along the way. The Polynesian Cultural Center enables guests to experience the history and culture of these Pacific Islanders. You can experience village life on Samoa, Fiji and Tahiti. Children can play Polynesian games and participate in other interactive activities. Ride in an outrigger canoe and enjoy an authentic luau. Waikiki Aquarium displays more than 3,500 marine animals representing the aquatic life of the Hawaiian Islands and tropical Pacific. Exhibits include sharks, monk seals, jellyfish and octopus. Children can view a wide variety of colorful fish, including real-life versions of Dory and Nemo. In addition to interactive exhibits, the aquarium sponsors numerous educational programs. The Honolulu Zoo encompasses 42 acres and displays more than 900 different tropical animals. Children can see elephants, orangutans and Komodo dragons as well as various primates and amphibians. The Nile crocodile, ruffed lemur and Palm Cockatoo and many of the other inhabitants are on the list of endangered species. Sea Life Park is a marine mammal theme park. Children can view animal shows featuring penguins, dolphins and sea lions. Special programs enable guests to interact with a variety of aquatic animals. Children can feed sea turtles and touch stings rays. Exhibits include the 300,000-gallon Shark Tank. Other attractions include a bird sanctuary and outdoor play structures. An Atlantis Submarine Adventure enables passengers to explore the colorful undersea world that lies off the coast. Children will be amazed by the teeming coral, fish and other marine life as they dive beneath the waves on the largest passenger submarine in the world. During this eco-friendly tour, visitors can learn about conservation efforts to preserve this unique habitat. The North Shore of Oahu is home to legendary surf spots, such as the Banzai Pipeline, Waimea Bay and Sunset Beach. It is also the location for the Waimea Valley. Known as the Valley of Priests, the area contains ancient Hawaiian architectural sites, an excellent botanical garden, the Waihi Waterfall and an amazing ecosystem of native plants and animals.